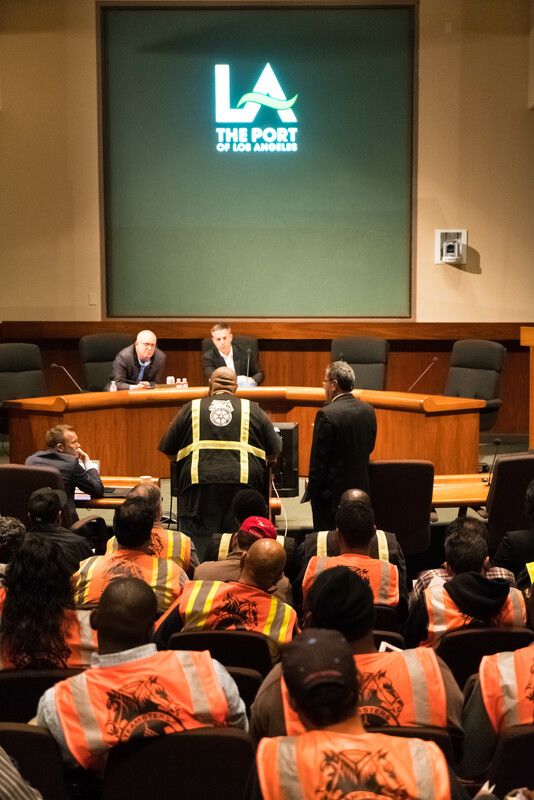 The Los Angeles City Council is preparing to demand the Port of Los Angeles and other City agencies investigate and report on actions to fix labor problems in the drayage and warehouse industries on port property. 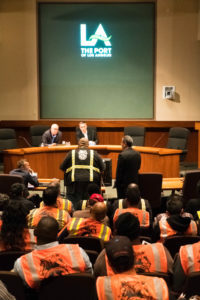 At a Special Meeting of the Trade, Travel, and Tourism Committee on November 28, 2017, Los Angeles City Councilmembers Joe Buscaino (CD 15) and Mike Bonin (CD 11) heard first hand accounts from port drivers and warehouse workers who handle cargo from the Ports of Los Angeles and Long Beach describing unacceptable conditions and treatment. Importantly, the motion develops strategies on the feasibility of denying access to companies that are in violation of local, state, and federal laws, including labor and employments laws…” The motion was passed by the Economic Development Committee and Trade, Travel, and Tourism Committee on November 28, and is expected to be passed by the entire Los Angeles City Council before the end of the year. Meanwhile, Phil Murphy, New Jersey’s new governor, has pledged to appoint “a labor commissioner, attorney general and treasurer” who would be “cracking down on 1099 fraud, and either bringing people into compliance, or putting them out of business,” especially when it comes to drayage companies at the Port of New Jersey. As we previously reported on, these actions follow introduction of federal legislation that also highlights the role and responsibility ports have in addressing drayage driver working conditions. Last month, U.S. Representatives Napolitano (D-CA-32) and Nadler (D-NY-10) introduced the Port Drivers Bill of Rights Act (H.R. 4144) and the Clean Ports Act of 2017 (H.R. 4147), a pair of bills that put ports in the crosshairs for fixing drayage driver labor problems. The bills’ co-sponsors include Representatives DeFazio (D-OR-4), Lowenthal (D-CA-47), Barragan (D-CA-44), Huffman (D-CA-2), Johnson (D-GA-4), Takano (D-CA-41), and Norton (D-DC-At Large).